Forty seven Republican Senators sent a letter to the government of Iran that ostensibly said, we don’t give a damn what our President and State Department accomplish in negotiating with you, we have the final word. If you still think that all the efforts to embarrass and denigrate Barack Obama are simply based on “differences of opinion,” you’re probably part of the problem. What other President in American history has been subjected to this kinds of treatment by the political opposition? I served in the United States Senate for thirty-six years. I believe deeply in its traditions, in its value as an institution, and in its indispensable constitutional role in the conduct of our foreign policy. The letter sent on March 9th by forty-seven Republican Senators to the Islamic Republic of Iran, expressly designed to undercut a sitting President in the midst of sensitive international negotiations, is beneath the dignity of an institution I revere. This letter, in the guise of a constitutional lesson, ignores two centuries of precedent and threatens to undermine the ability of any future American President, whether Democrat or Republican, to negotiate with other nations on behalf of the United States. Honorable people can disagree over policy. But this is no way to make America safer or stronger. Around the world, America’s influence depends on its ability to honor its commitments. Some of these are made in international agreements approved by Congress. However, as the authors of this letter must know, the vast majority of our international commitments take effect without Congressional approval. And that will be the case should the United States, the United Kingdom, France, Russia, China, and Germany reach an understanding with Iran. There are numerous similar cases. The recent U.S.-Russia framework to remove chemical weapons from Syria is only one recent example. Arrangements such as these are often what provide the protections that U.S. troops around the world rely on every day. They allow for the basing of our forces in places like Afghanistan. They help us disrupt the proliferation by sea of weapons of mass destruction. They are essential tools to the conduct of our foreign policy, and they ensure the continuity that enables the United States to maintain our credibility and global leadership even as Presidents and Congresses come and go. Since the beginning of the Republic, Presidents have addressed sensitive and high-profile matters in negotiations that culminate in commitments, both binding and non-binding, that Congress does not approve. Under Presidents of both parties, such major shifts in American foreign policy as diplomatic recognition of the People’s Republic of China, the resolution of the Iran hostage crisis, and the conclusion of the Vietnam War were all conducted without Congressional approval. In thirty-six years in the United States Senate, I cannot recall another instance in which Senators wrote directly to advise another country—much less a longtime foreign adversary— that the President does not have the constitutional authority to reach a meaningful understanding with them. This letter sends a highly misleading signal to friend and foe alike that that our Commander-in-Chief cannot deliver on America’s commitments—a message that is as false as it is dangerous. The decision to undercut our President and circumvent our constitutional system offends me as a matter of principle. As a matter of policy, the letter and its authors have also offered no viable alternative to the diplomatic resolution with Iran that their letter seeks to undermine. There is no perfect solution to the threat posed by Iran’s nuclear program. However, a diplomatic solution that puts significant and verifiable constraints on Iran’s nuclear program represents the best, most sustainable chance to ensure that America, Israel, and the world will never be menaced by a nuclear-armed Iran. 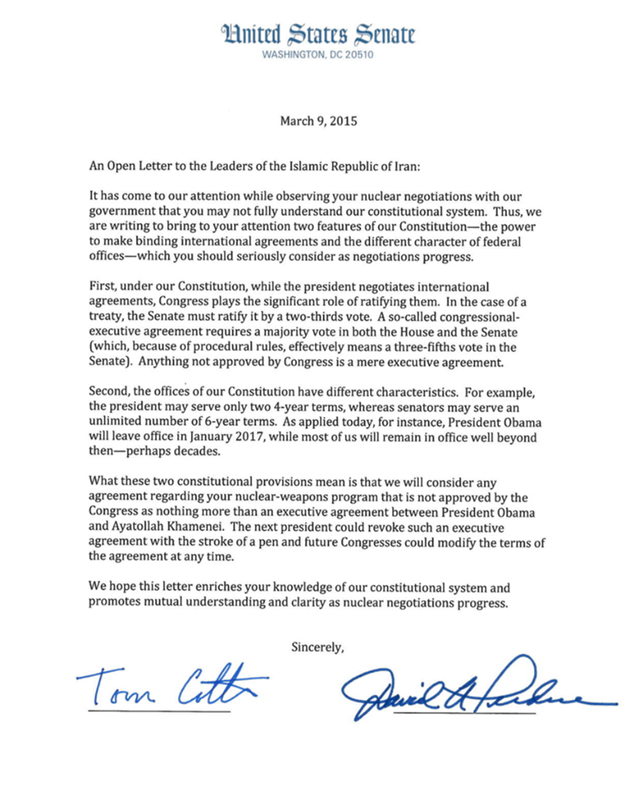 This letter is designed to convince Iran’s leaders not to reach such an understanding with the United States. The author of this letter has been explicit that he is seeking to take any action that will end President Obama’s diplomatic negotiations with Iran. But to what end? If talks collapse because of Congressional intervention, the United States will be blamed, leaving us with the worst of all worlds. Iran’s nuclear program, currently frozen, would race forward again. We would lack the international unity necessary just to enforce existing sanctions, let alone put in place new ones. Without diplomacy or increased pressure, the need to resort to military force becomes much more likely—at a time when our forces are already engaged in the fight against ISIL. The President has committed to prevent Iran from obtaining a nuclear weapon. He has made clear that no deal is preferable to a bad deal that fails to achieve this objective, and he has made clear that all options remain on the table. The current negotiations offer the best prospect in many years to address the serious threat posed by Iran’s nuclear ambitions. It would be a dangerous mistake to scuttle a peaceful resolution, especially while diplomacy is still underway.